The hills will be alive with “The Sound of Music” when the Penn Manor Players presents the classic Rodgers & Hammerstein musical Feb. 27 to March 7 on the Penn Manor High School auditorium stage. The musical will be presented at 7:30 p.m. Fridays and Saturdays, February 27 and 28 and March 6 and 7. In addition, there will be a matinee performance at 2 p.m. Saturday, February 28. The talented cast includes Abby Geiger as Maria Rainer and Alex Davis as Capt. Georg von Trapp. Several Penn Manor elementary students also perform as the von Trapp children. Tickets are $6 for senior citizens and students and $8 for the general public if purchased in advance using the ticket order form below. Prices are $1 higher on the day of the shows. All seats are reserved. Tickets also may be ordered online at the link below. For more information, contact Melissa Mintzer . 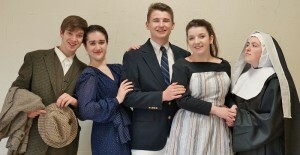 Appearing in Penn Manor High School’s “Sound of Music” are, from left, Paul Harrold (Max), Alyssa Crook (The Baroness), Alex Davis (Capt. Georg von Trapp), Abby Geiger (Maria Rainer) and Haley Hoffer (Mother Abbess).